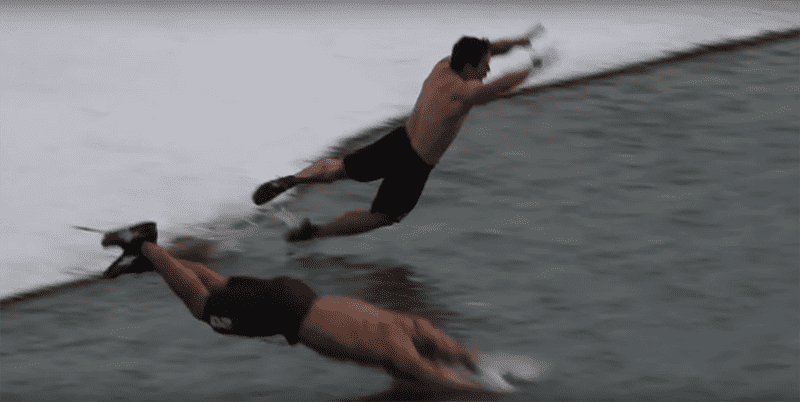 In the winter, with snow on the ground, Rich Froning and Dan Bailey swim in the almost freezing lake near Froning’s house. They do it to build mental toughness for their Crossfit performances, and it hurts, but it works. In the 2015 and 2016 Crossfit Games, the athletes had to complete sea swims. This caused havoc amongst many of the athletes, who were much happier about having their feet firmly planted on dry land! It was less the physical aspect and more the psychological side that caused issues, and many of the athletes struggling badly. So what exactly makes open water swimming such an enjoyable challenge? And how will it turn you into a better Crossfitter? Swimming in lakes and rivers takes a different kind of mental attitude. Aggression can carry you through an intense Crossfit WOD, but swimming requires a tranquil and perfectly focused mind. When we swim in the sea, we are aware of the depth below. It affects our minds with a crushing kind of ancient and primal fear. You must control this fear as you swim, diminish it with your confidence and pride in your own physical ability. To be aggressive doesn’t work. It will put you into a panic, affect your breathing and may get you into trouble. When you go back into the BOX after a few open water swims, you will be tougher, and your mind will be equipped with this new tool to fight against and destroy that voice inside that tells you to give up. Once you progress and start swimming for longer, in more regular patterns, you will significantly improve your cardio and strengthen your heart and lungs in the process. Swimming has the additional benefit of not stressing your joints and ligaments in the way that other cardio can sometimes do. As you are (hopefully) buoyant in the water, you can work on your stroke and breathing techniques without any risk of shin splints or similar afflictions. And that’s only the physical side. Open water swimming has also been shown to significantly combat mental illnesses such as depression and anxiety. The body releases huge amounts of endorphins, adrenalin and dopamine both during and after a swim, to help you adapt to and overcome the conditions of the water. There is a refreshing and undeniable high that follows each session. Operating outside your comfort zone, by definition, requires a certain amount of discomfort. When you swim in cold water, you adapt, and your body learns to cope with the temperature. In other words, you toughen up. There is no complaining and no whining, you put up and get on with it, and this is an attitude that defines the mentality of crossfitters around the world. To strengthen this way of thinking will only allow you to endure more, go for longer and improve your overall performances. Open water swimming builds muscular strength and endurance in it’s own unique way. Compare the physiques of serious competitive swimmers with professional long distance runners for example, and you will see how swimming builds muscle as well as endurance, instead of stripping it off as in the example of long distance running. A decent swim in an ocean, lake or river will act as a great strength and conditioning workout for your entire body, especially your core, back and shoulders. This will also have positive effects on related lifts and exercises in Crossfit. Try testing your max number of pull ups after a series of open water training swims (in freestyle) – I bet it increases.